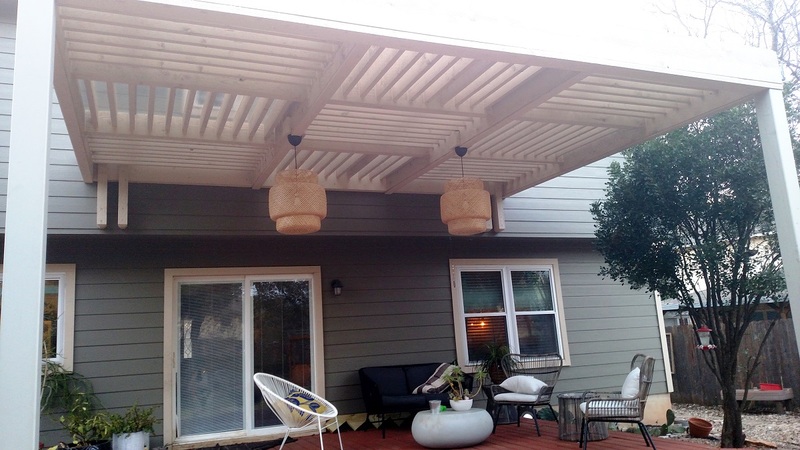 Archadeck of Austin is known for our massive, beefy pergolas, but this time we outdid ourselves by designing one that’s completely different, at the request of these Southwest Austin homeowners. 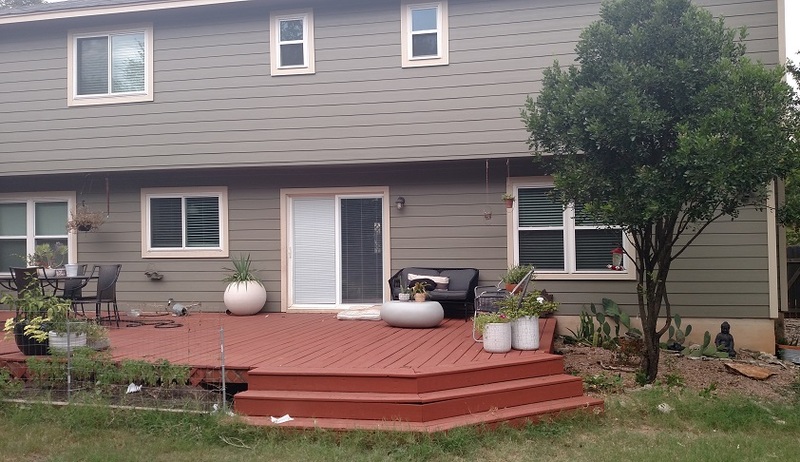 They had a large deck and wanted to spend more time outside, but they needed a deck cover. 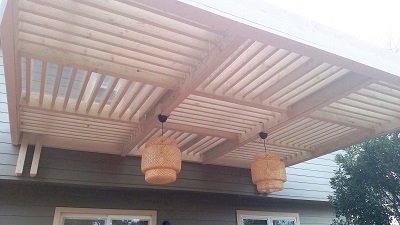 The clients knew they wanted a custom design for their pergola, because they didn’t want the traditional-style pergola. Something contemporary or even retro, unique and super cool. Additional criteria: fewer posts than pergolas usually have, a more open and airy feeling, a cover to protect the deck from rain, and electrical wiring for light fixtures. — Here is the space before we began the pergola addition. 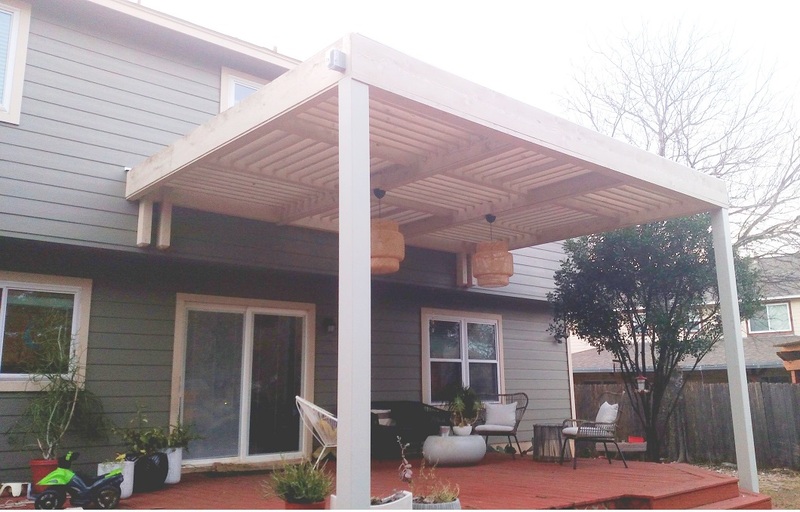 It was a design challenge, but this Austin, TX, pergola builder always delivers. The modern pergola we designed for this home is over 21 feet wide and has only two support posts. With a span that wide, we would usually rely on a third post in the center and three more on the back side— but not this time. The homeowners wanted fewer posts, so we gave them fewer posts. Two posts. In order to accomplish this architectural feat, we fabricated steel posts and used an engineered glulam beam from post to post to carry the span. (Glulam = glued laminated timber, very strong!) We then wrapped the posts with rough-sawn cedar and used a 4×12″ cedar beam running back to the house. Horizontal and vertical planes were used in the design of the pergola. We bolted 4×4′s to the sill plate and ledger in order to meet the structural engineer’s satisfaction for support. These provide the height the homeowners wanted in the design. Satisfying the client’s request for light, we installed wiring for the two hanging lights as well as an electrical outlet on the outside edge of the pergola. The woven-basket-type hanging light covers serve as the perfect finishing touch, and the homeowners plan to add festival lighting in the weeks ahead.